Opening day brings a bounty of rewards. For most of his 30 years of waterfowl hunting, Randy Hill of Montecito, Calif., has opened the California season on the Suisun Marsh. "Opening day is usually one of our best days of the year," he said. "Most openers on the Suisun are sunny and hot." It was just such a day when he and good friend Rob, accompanied his yellow lab, Yeager, jumped in the boat and headed for the blind. After loading up and setting themselves up with some "jungle coffee," they settled in to wait for shooting light. The action started swiftly, the first shots ringing out across the marsh to the east. "I was looking to the north and east for ducks, when a pair of mallards dropped right into the decoys on my side," Hill said. He wasted no time pulling off a double, dropping first the drake and then the hen with 25-yard shots. Rob immediately sent Yeager for the retrieve, and she went straight for the drake. "She was so excited, instead of bringing it back, she just opened her mouth and grabbed the hen, too," Hill said. 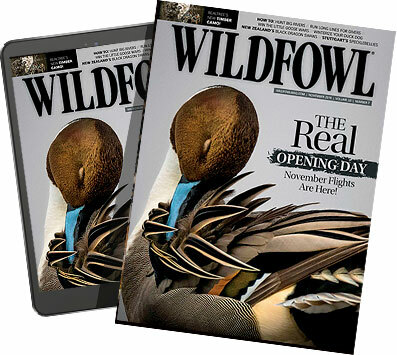 "She brings back this huge pair of mallards with one mouthful and drops them on Rob's blind." With the action heating up, Rob and Hill exchanged a quick high-five, then returned to the business at hand. After shooting eight teal and a pair of spoonies between them, it was time for a breakfast break. While Hill started preparations, Rob decided to look over the morning's bag. "He picks up the hen I shot, and it's got a band on it," Hill said. "I start hollering. Then he picks up the drake, and it's got two bands, including a $100 reward band." So Hill shot a double, watched a double retrieve and ended up with double on bands, including a mallard that is double-banded. Not a bad way to start the season. "I kept the green band," Hill said. "I gave one band to Rob, and Yeager wears the third on her collar."